Woodland Birds – Let's Paint Nature! Last weekend while hiking, I came upon some benches that had walnuts on them. I did not put them there. Feeding the wildlife is prohibited in the Cook County Forest Preserves, it’s a definite no-no. But boy did I get to see some up close birds! 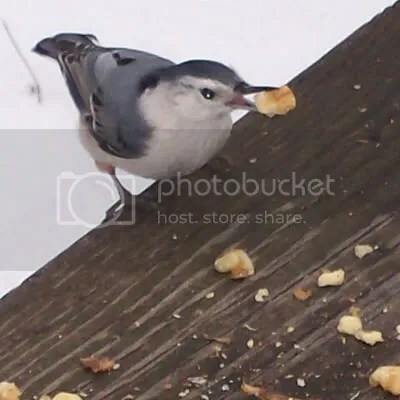 My favorite of the bunch: white-breasted nuthatch. Hey…Look at me when I’m talking to you. Ha ha. 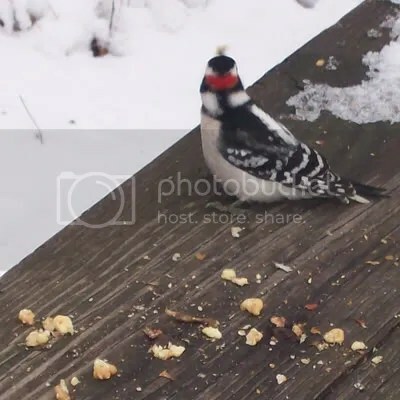 This male downy woodpecker wasted no time fleeing from the scene. Chickadee-dee-dee-out-of-here! Isn’t that what they say? Be nice gals, there is enough to share. 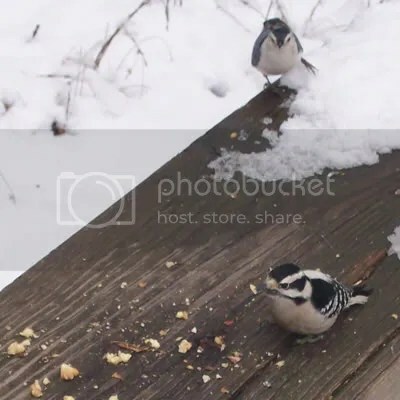 One female downy woodpecker (bottom right) and one white breasted nuthatch (top right). 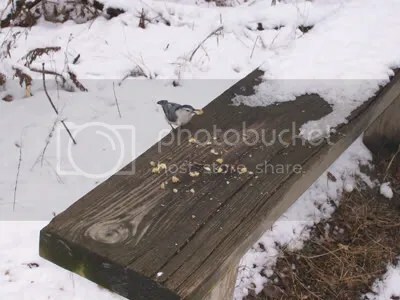 Here is a close up of the white-breasted nuthatch. This bird is so tiny, maybe a whole 5 inches. I love this picture because I can see the pink inside his beak. 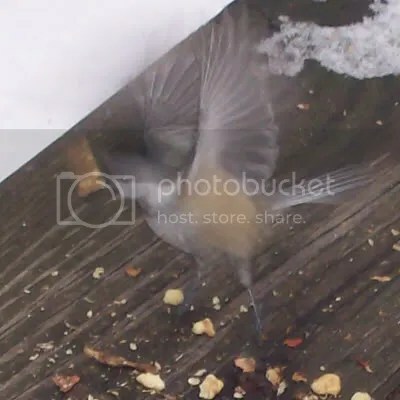 The nuthatch makes a funny, short, deep, beep beep beep sound…it reminds me of being at a carnival standing next to the toddler car ride that goes round and round and all the little tikes are beeping their car horns. I was very excited to study these woodland birds. Maybe soon we will make a painting! I love those little Nuthatches (or hatchers)! They’re so hyper – just like a Wren. Great shots. That last one would make a great painting! Happy holidays, hon. My best to you & yours for 2010! It is cool to see the birds up close. Great shot of the nuthatch. Alan: So do I love them! I like how they hop around upside down as they are looking at you, checking you out. Lana: Yes, I can’t wait to paint that little guy! Happy Holidays to you too, next year will be even better. Eileen: Thanks! I am greatful they allowed me to watch them sooo close!